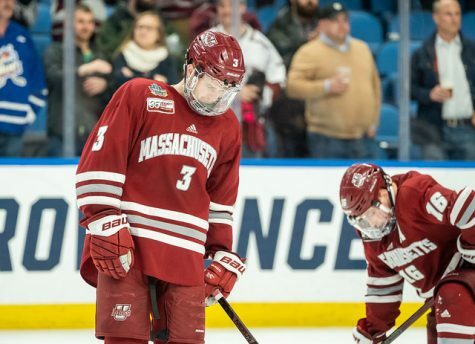 Costly mistakes were the difference this weekend for the Massachusetts hockey team, as it lost the finale of a home-and-home series against Providence College, 3-2, on Saturday. 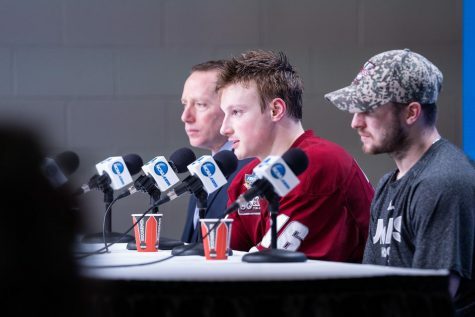 This came after the two teams played to a 3-3 tie on Friday at the Mullins Center. 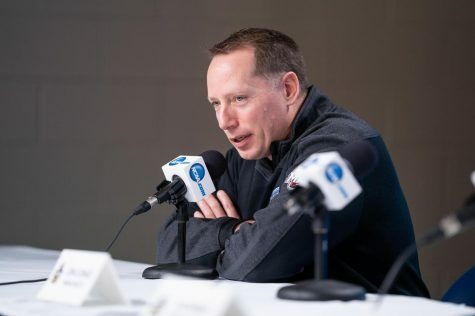 In the second game, the Friars (2-4-1, 2-2-1 Hockey East) were 2-for-4 on the power play, as they jumped out to an early 2-0 lead by the end of the first period. 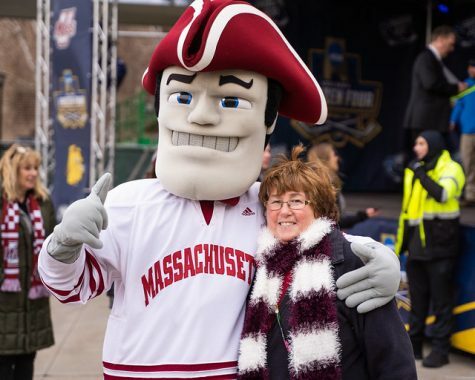 Daniel New found an unguarded Aaron Jamnick on the edge of the faceoff dot, who put a shot past UMass goalie Paul Dainton to put the Minutemen (0-4-2, 0-2-2 HEA) in a quick two-goal deficit. 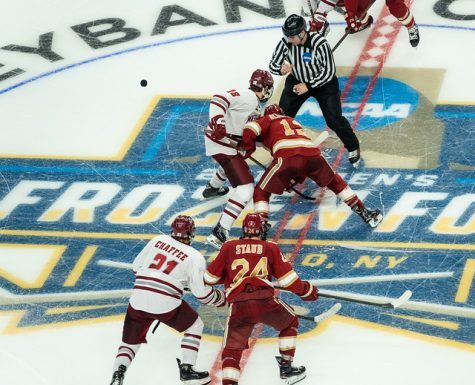 UMass immediately responded just 41 seconds later, taking advantage of a power play opportunity of their own. 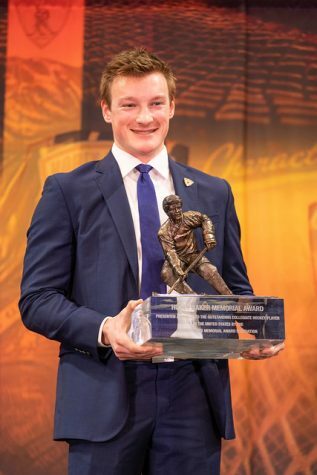 After Branden Gracel won a faceoff, the puck found Joel Hanley, a freshman defender, who settled it before firing a slap shot that ricocheted off a Providence defender before landing in the back of the net. It was Hanley’s first collegiate goal and it cut the deficit to one. The Minutemen continued to press into the second period, outshooting the Friars 11-8, but the score remained 2-1 entering the third period. 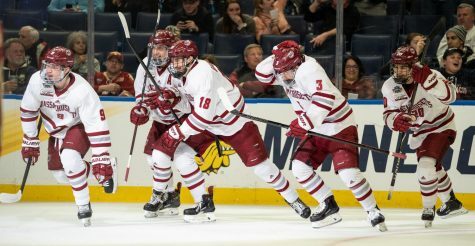 While UMass was given three-straight power plays to begin the third period, it couldn’t capitalize, and PC doubled its lead on its only power play of the period. Three and a half minutes later, the Minutemen answered again as Michael Pereira scored his second goal in two games. However, the Friars held off a late desperate push and took the only win of the weekend. 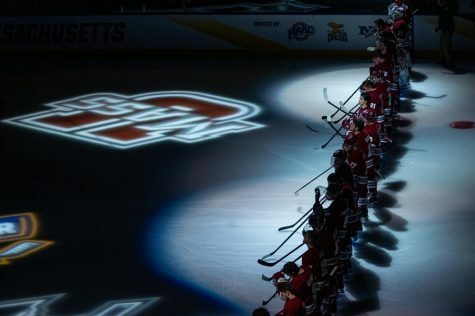 Friday’s game also had its fair share of miscues, however the Minutemen were able to salvage a 3-3 tie after Darren Rowe scored a power play goal with three minutes and 43 seconds remaining in the game. The Minutemen scored first midway through the first period. Doug Kublin scored his first goal of the season just as a UMass penalty expired. T.J. Syner brought the puck up through the neutral zone and gave a square pass to Kublin, who had followed the play. Kublin rifled his shot past Providence goalie Alex Beaudry for the early lead. The Friars scored later in the period to knot the game at one after the first. Neither team could find the back of the net until the last 43 seconds of the period when both squads exchanged their second goals of the game. The Friars goal came with one second left in the period off an ill-timed wrap around pass by a UMass player. Dainton, the team’s captain, also came away disappointed with how a few Providence goals were let in on Friday. However, Cahoon sees positives from these two games. His players always seem to fight for a comeback.